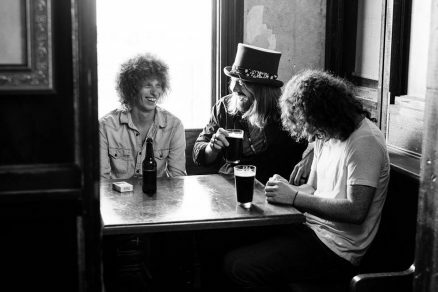 Greasy Tree is a blues infused Power Trio with excess hair and even more attitude. The band’s freshman, self-titled album was released in February of 2017. With the help of Pete Matthews (Devon Allman, Evanescence, and Paul Simon) and Toby Vest of High/Low Recording out of Memphis TN, the album has a raw, unfiltered sound that reminds us of the greats. Cameron Roberts’ scorching guitar riffs/vocals, dynamic beats/vocals from drummer Jacob Brumley, and gritty bass tones/vocals from Red Dorton create a chemical reaction of Rock and Soul that is bound to take you back to your roots. The band itself may be greasy, but these three artists are well seasoned. The trio met through other projects and eventually joined forces on a European tour in 2015 with Teenage Head Music. The dynamic of the trio was undeniable and they quickly turned their attention towards their new project, Greasy Tree. Between the three musicians, there are three European tours under their belts and individually they have shared the stage with Shinedown, Charlie Daniels, Saliva, Jimbo Mathis, and many more. With work history involving A&R Firm, Big Noise LLC., Red Wax Music LLC, and Games Productions Inc., the bands’ past projects have been licensed for use in three movies, and in several top shows including Big Bang Theory and Justified. Greasy Tree have already played Festivals such as Downtown Jonesboro BBQ Fest 2016 and 2017, 19th Annual Osceola Heritage Music Fest 2017 (which hosted over 10,000 visitors), and Bay Harvest Festival 2017. The band has shared the stage with artists such as Bret Michaels, Barrett Baber, Scotty McCreery, and The Brothers Osborn. Also, Greasy Tree just completed a very successful 26 date European Tour in Jan/Feb 2018 with Teenage Head Music. Greasy Tree is primed for success and excited to break into new markets. The only question is whether or not the universe can handle getting greasy!